Blondie and Brownie: I'm a Barilla Brand Ambassador! A couple of weeks ago, Barilla approached us about becoming Brand Ambassadors during their Summer of Italy. Barilla wants people to start sharing their table more often with family and friends, and we like that message. Brownie and I hemmed and hawed for a few days over whether to become ambassadors; we never started this blog in order to become paid shillers for corporations, but we both prefer Barilla over other pasta brands, and they were offering compensation for us and giveaway tickets to an Andrea Bocelli concert for you. Then we found out that most of the events would also benefit the Food Bank for NYC, and decided to go for it. Since she has more than enough on her plate, I'm going to be one of their Brand Ambassadors. 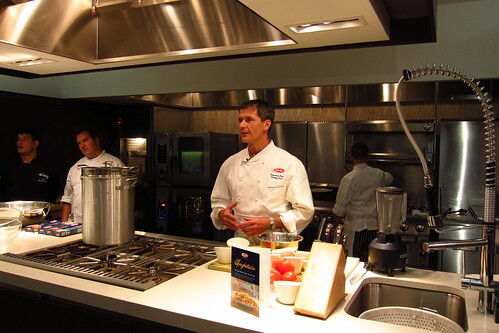 And this past week, Barilla invited me to my first event, a lunch made by their Executive Chef Lorenzo Boni. The lunch was held in the new Midtown kitchen space, The Kitchen. 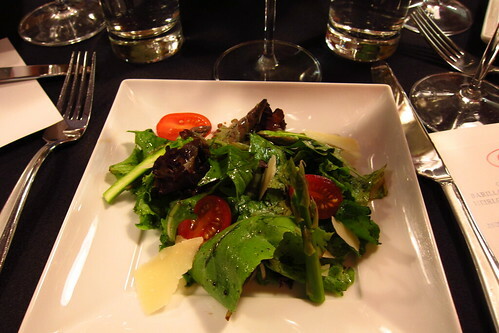 We started with a light salad while hearing about all of the events taking places throughout the city during the next month and a half, most of which will be accessible by the public. During the week of August 15th, there will be a Barilla food truck handing out meals throughout the city, where every meal handed out will be $1 for the Food Bank. The Food Bank is also benefiting from part of the proceeds of the Casa Barilla that will be set up in Rumsey Playfield in September. It's all culminating in an Andrea Bocelli concert in Central Park on September 15, which two of our lucky readers will be going to! After hearing about everything planned, it was time to man small kitchen stations to make our own lunch. I've been exploring a little with pesto lately since my CSA has been giving us a far amount of basil, so I was excited to learn a new method. This one involved adding pistachios to the mix before mixing it in with pasta. Chef Boni did a good job of explaining what to do and came around to check on us as we progressed. Of course afterward we sat down to eat what we made! 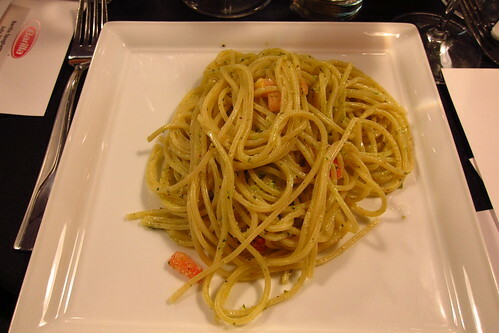 Our table ended up not getting the same dish of pasta pesto that my station had made, and I think we were worse of for it. I also didn't get the chance to get anymore tomatoes after everyone had been served. It was good regardless and I'm excited to make this again for a simple weeknight dinner. 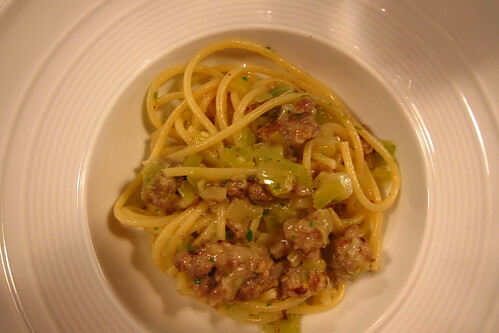 But Barilla made good with me in the second dish they served: Pasta with Sausage and Leeks (the picture at top). I'll admit, I'm not familiar with leeks in their many forms, but what's not delicious when sauteed to transparent with butter. I could have eaten about three bowls of this, and it's another really easy meal that sounds all fancy. 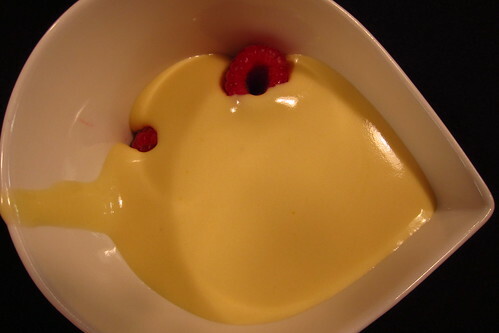 For dessert we were treated to Marsala Zabaione. I'm not a fan of zabaione, no matter who makes it because I'm not a fan of Marsala. It's too heavy for my liking. Their zabaione was respectable, very eggs and light, not too sweet. If only they had made zabaione ice cream, that I could have gotten behind. Full disclosure: I was invited to this event on behalf of Barilla. I am a sponsored and compensated Brand Ambassador for their Summer of Italy initiative.